I hope you all had a great week and have wonderful things planned for the weekend. This weekend is supposed to be 'warm' (somewhere around zero degrees) so I will have to get out and enjoy it before it gets cold next week. Guess it's just that time of the year.... and only 37 days left before Christmas if I can still count! Yikes!! So, I have made another Christmas card, this time using a cute Happy Hoppers stamp. I just love this image to bits. Other - TH tattered pine cone inked with walnut stain, dabbed with white acrylic paint and then dabbed with rock candy stickles; crinkly ribbon; McGill pine branch punch inked with frayed burlap; brown wire dipped in gold embossable ink and embossed with gold tinsel (glittery) powder; creamy coloured berries (from Michael's floral department); light green rhinestones. Thanks for popping in and for taking the time to leave a comment! I love reading them and it gives me the chance to pop in to see your wonderful creations too. Last, but not least, a big thank you and welcome to my blog's newest follower, Sandra. Oh this is just gorgeous, love the cute image & your colouring is fab! Dawn, your card is the cutest that I've seen this image colored in. Super darling coloring, with love bright shades, overlapping layers. The sentiment gives an almost vintage feel. Delightful! How fun is that ... carrots for the holidays (I think there'd be a mutiny at my house if that were the case) ... so glad you joined us at jingle belles. Dawn, awesome coloring on this cute Happy Hopper image. Such a sweet card. Thanks for joining us at the House Mouse and Friends Monday Challenge. Wow this is gorgeous love the design & papers beautiful colouring..these cute guys trimming the tree..perfect image for the chall theme. Hi Dawn, thank you for leaving such a lovely comment on my blog and becoming a follower, I am now repaying the favour :) Your blog is gorgeous and your creations are beautiful. I was just looking for inspiration for the Jingle Belles challenge and came across your card. I absolutely love it! Wonderful non-traditional colors, adorable image, and a perfectly constructed layout. I'm pretty new to card-making, just one year now. I'm not sure how you colored the image...I assumed with copics but you said it was distress inks. Do you use a little dauber of some sort? So stinking cute! Obviously carrots are a must-have treat for bunnies - and what else would they decorate with? 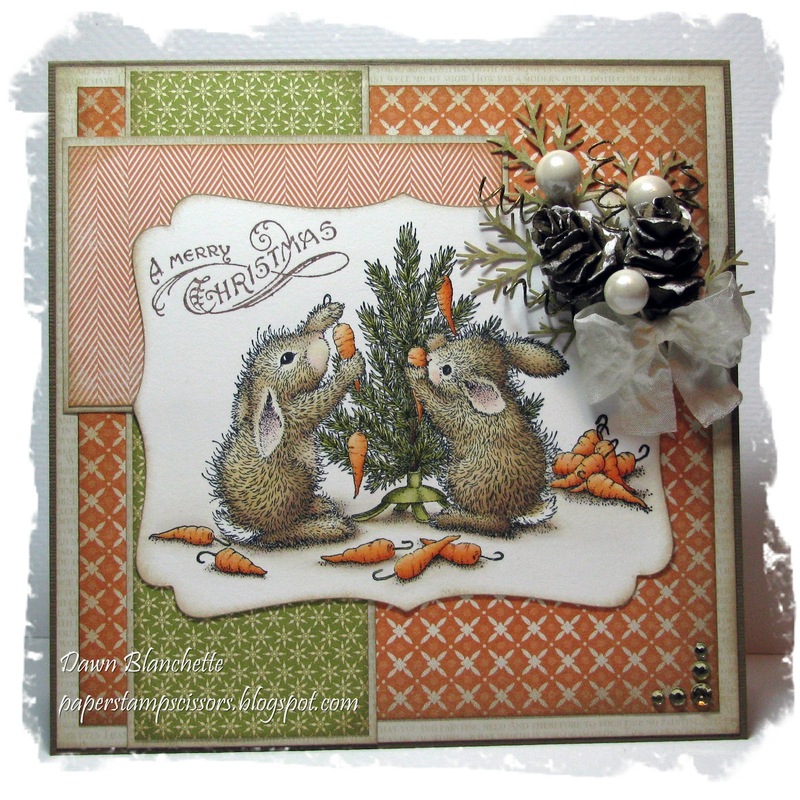 Love the pinecones you've added - the berries and branches make such a wonderful embellishment! Wow, this is just amazing. I just love the colors and how you colored the bunnies! Gorgeous card! Your colouring is beautiful.